Oriental Watch is a luxury watch retailer that owns stores in China, Hong Kong, Macau and Taiwan. The company’s stock is currently selling for HK$1.05 and my estimate of liquidation value is around HK$2.50-$3.00. Any company selling for 35-40% of liquidation value is bound to have its fair share of problems and Oriental Watch is no different. They were profitable as recently as 2014 but there are significant headwinds facing the Asian luxury watch segment. Thankfully the management team has already been making moves to cut expenses and return to profitability. One note: they are listed on the Hong Kong Stock Exchange (symbol: 0398) and on the American pink sheets (ORWHF). Unless otherwise stated, all numbers in this write-up will be in Hong Kong Dollars (HK$). The conversion is currently HK$1.00 to US$0.13. While the majority of their stores are in China (68 out of 87), these stores are smaller and less important to the story than the thirteen locations in Hong Kong. The company’s two operating segments are Hong Kong and then China, Taiwan and Macau combined as one. For simplicity I’m going to refer to this second segment as China since only six stores total exist in Taiwan and Macau and they are all through joint ventures. The thirteen Hong Kong stores make up around 70% of revenue and are still profitable as opposed to the China stores dragging down the results. Importantly, 65-70% of its sales are Rolex watches. Rolex is without a doubt the most iconic watch brand in the world and probably the most iconic luxury brand period. Rolex notoriously caps their annual production to keep demand and the company’s exclusive status high. Because of this, Rolexes hold their value much better than most luxury goods (or any goods for that matter)—it’s not uncommon for some models to actually appreciate in value over time. All of this is important because the majority of Oriental Watch’s assets are in inventory (and thus, in Rolexes). Deciding what these watches would be worth in a fire sale is important to determining the company’s liquidation value—which we’ll get into below. Watch retail is a pretty commoditized business. It doesn’t take much to lease a space, source watches from manufacturers or distributors and go into business. For several years up until 2013 the luxury retail market in China and Hong Kong was booming. Retailers rushed to open up as many stores as possible and now, as the economies are slowing, there is a major glut of luxury shops. To give you an idea, in Causeway Bay, Hong Kong (this is just one business/shopping district within the city) there are nine Rolex retailers (one of which is Oriental Watch’s). In all of New York City there are only six Rolex retailers. So what’s caused the luxury retail slowdown? President Xi Jinping came to office in China in November 2012 and has been on an anti-grafting campaign ever since. If you don’t know what that word means (like I didn’t), he’s basically cracking down on corruption, especially the use of public funds for extravagant gift giving. His campaign has been very successful, busting many government officials, military personnel and even teachers. Macau has also been cracking down on organized crime in their casinos which has had a similar effect. Even more important than either of those is the Hong Kong government’s crackdown on Chinese tourists. This has led to public protests against Chinese mainlanders which has pushed them to travel to nearby Japan and Korea instead of Hong Kong. This is important because mainland Chinese tourists used to account for around 50% of Hong Kong retail sales and now that very population is being pushed away. China has very high taxes on luxury goods which has always encouraged their (growing) middle and upper class citizens to do their shopping across the border. Increased competition from online shopping has only added fuel to the fire. All of this has culminated in Hong Kong and China’s luxury goods sales decreasing dramatically. 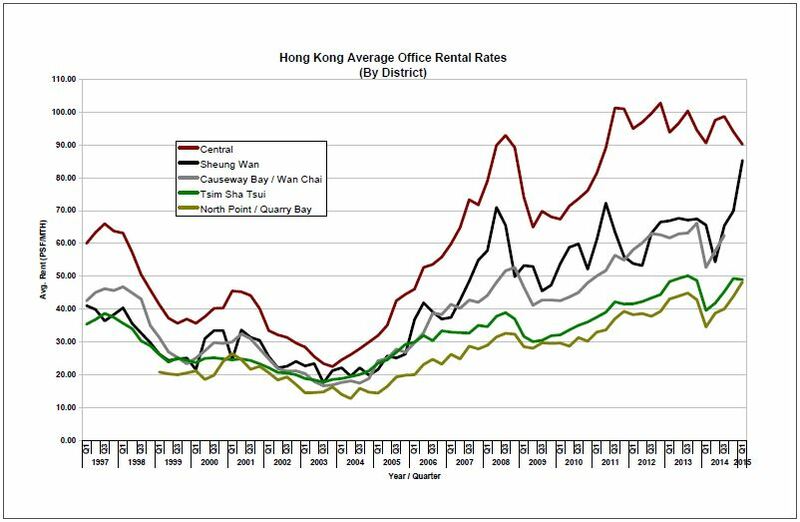 Hong Kong saw a 13.7% decrease from 2013 to 2014 and a 15.9% decrease in the first two months of 2015. Fortunately, it’s fairly easy for watch retailers to downsize during bad years. As leases come up for renewal they can simply not renew and close the store. Almost every public watch retailer in the China and Hong Kong area has decreased their store count the past couple years. Oriental Watch has gone from 109 units in 2013 to 87 today, a 20% decrease in just two years. Even though China and Hong Kong’s luxury markets are struggling, looking farther out there are still some positive signs. First off, China’s middle class has been rapidly expanding and will continue to grow in the near future. China is expected to surpass Japan by 2018 as the second largest market for luxury goods. As a data point, in 2008 the number of Swiss watches per 1,000 people in China was 0.23. This same number was 0.5 for Malaysia and 3.4 for Japan. As the country gets wealthier more and more people will be able to afford Rolexes. Dr. Yeung Ming Biu is the 78 year old co-founder and Chairman. This is an interesting read about Dr. Yeung and how he started as a watch apprentice at age 14, started his own company at 21 and grew it into what it is today. Finding out how much of the company he owns is not an easy task. Simply looking at his beneficial shares listed in the annual report is not accurate as he has ownership in several companies that, directly or indirectly, own shares in Oriental Watch. Deciphering the corporate structure leads me to believe he and his wife own a combined 88 million shares (or ~15% of the company) worth HK$105 million. Compare this to his 2014 income of HK$4.2 million and his shares are quite significant. I looked at every annual report I could find and from 2006-2015 Dr. Yeung made a total of HK$61 million in annual incomes. Of course a lot of this went to taxes and living expenses so it appears his Oriental Watch stock is a very significant portion of his net worth. Dr. Yeung’s daughter is on the board and his son, Mr. Yeung Him Kit, is the Managing Director (basically the CEO). 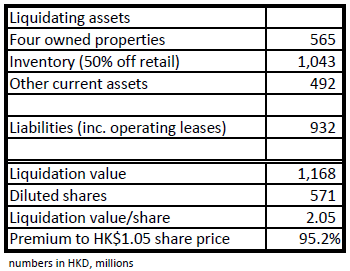 His share ownership is also not obvious but I believe he owns 11.8 million shares worth HK$14 million or a little more than 3x his 2014 income of HK$4.5 million. Of the nine directors, three are a part of one family and the “newest” director came on board in 2003. It’s safe to say this is a family run business and the current management team isn’t going anywhere. Luckily they are well aligned with us and their annual bonus encourages them to get the company back to profitability as soon as possible. Each year, 8.9% of the company’s pre-bonus profit gets split evenly between the six executive directors. Their compensation was 40% lower in 2014 vs 2013 which was 34% lower than 2012. So even though that 8.9% bonus is on the high side, they have certainly been feeling the pain these past couple years. During times like this it’s good to know they’re highly motivated to shut down money-losing stores to improve the bottom line. Over the years, management has more or less done what they’ve said they’re going to do. When the economy was good they talked about raising capital to grow store count and for the past couple years all they’ve been talking about is downsizing. They have also been very straightforward about the headwinds they face. From the 2015 release: “The group expects that the trend of the luxury retail market, especially in the watch industry, is likely to continue to deteriorate.” While that doesn’t give an investor the warm and fuzzies, I prefer management teams that don’t sugarcoat things. Obviously rent increases are bad for the leasee , but thankfully Oriental Watch has some property of their own to offset the increase. They own four of their Hong Kong properties which have increased substantially as of late. In 2012 they sold a store for HK$86.6 million that was only on the books for HK$10 million! And the real estate market has only continued to explode since then. Similar to Consolidated-Tomoka, I’ve spent a lot of time looking at local real estate sales/listings and reaching out to local commercial realtors. Based on what I’ve seen, their four owned properties are worth around HK$565 million. If you remember from the very beginning of this post, I stated the liquidation value is between HK$2.50-$3.00. The above table is the absolute most conservative estimate I can put on the company. I think 50% off retail for inventory that is mostly Rolexes is too conservative and there are also some non-current assets that I believe they’d receive in a liquidation (in addition to some liabilities they wouldn’t have to pay). Making these adjustments gets the number in the HK$2.50-$3.00 range. Knowing something is extremely cheap is more important than knowing exactly how cheap. None of this really matters if the company continues to lose money and slowly destroy its value though. I don’t think this will happen. As bad as things have got, they actually had positive EBIT in their most recent fiscal year (FY15 ended 3/31/15). The company’s finance costs (e.g. interest expense) is what brought them into the red. Thankfully, interest charges have been decreasing every period as they pay off loans and roughly two-thirds of their current bank loans are due within a year (which they have enough cash on hand to cover) so these are mostly going away. And since they’re in downsize mode I doubt they’ll be raising anymore debt in the near future. So a company selling for ~35% of liquidation value that has a clear route back to profitability, you probably assume I’m a buyer right? Not yet. These are the exact type of deep value, extremely cheap companies I love. The problem is Wiedower Capital is already 100% invested so I have more ideas than I have money to invest. Oriental Watch is sitting in the on-deck circle however, and if anything changes with my current holdings, this will be the first company I buy. Next ›How Should I Be Paid?